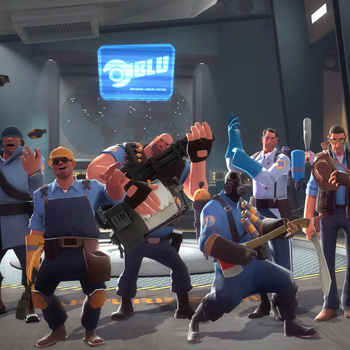 Team Fortress 2 pits two rival construction crews against each other on six themed maps. Nine classes are available when forming a team: Pyro, Heavy, Spy, Scout, Sniper, Medic, Engineer, "Demoman," and Soldier. Each class offers unique abilities and equipment to complete objectives, from a medic's healing powers to a spy's disguises for eluding detection. Three play modes include Capture-the-Flag, Control Point, and Territorial Control. Capture-the Flag involves retrieving a briefcase from the enemy's base before the opposition does the same. Control Point has teams maintaining control over four areas on a map, two of which are in contention, before one side can capture the rival team's base. Territorial Control features five contested areas, allowing for a more open play style. Team Fortress 2 is further distinguished by its distinctive, cartoon-like visual style as well as its detailed stat tracking.